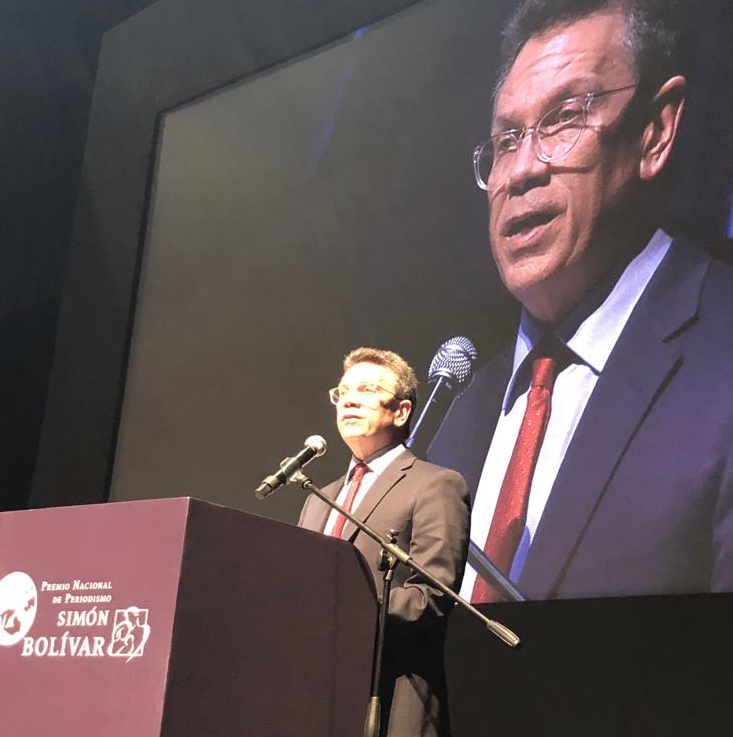 My remarks for the Simón Bolívar National Journalism Awards, Bogota, Colombia, Nov. 15, 2018. This is a critical moment for journalism around the world, when the path ahead seems uncertain. We lived through the dawn of the Information Age and saw the great promise of the internet; but it now seems like we are in a darker time. When I started PolitiFact in 2007, I was filled with hope about what the digital revolution would bring. There was a belief the internet could make information more widely available, bring people together and help us hold power accountable. Like many of you, I am wondering if those hopes were misplaced. But we can’t get despondent about how things have turned out. We need to reimagine our roles as journalists and harness the power of technology to combat misinformation. A little history: I started PolitiFact out of my own guilt. I had been covering the White House and Congress for the St. Petersburg Times, a Florida newspaper that is now called the Tampa Bay Times. I had grown tired of hearing politicians’ false claims and felt I had been complicit by publishing them in my news articles without scrutiny. The internet offered a new way for us to hold politicians accountable for what they said. I went to my editors with a crazy idea: instead of having me cover the 2008 campaign like all the other political journalists, how about if I started a fact-checking website? In fact, they liked the crazy idea so much, they let me start a team with some of the most talented reporters and editors at the paper. They also let us break the rules. We built our own content management system and took some bold steps that most newspaper editors would never allow. We invented the Truth-O-Meter, which rated politicians’ claims from True to “Pants on Fire.” It made substantive articles about policy accessible to a wider audience. We created a unique form of journalism. Instead of publishing traditional articles, we published fact-checks of politicians’ statements in a new structured form that could be collected on report card pages and tallied to tell people how many true, half true or Pants on Fire statements a politician had earned. PolitiFact was truly new journalism in the internet age. A key to PolitiFact’s success was the culture of my newspaper. My editors were not only willing to let me try my unusual idea, they encouraged that kind of creative approach in everything we did. They also had a deep commitment to accountability reporting. They believed – they still believe – that holding power accountable is one of the fundamental missions of journalism. PolitiFact became part of a growing community that included FactCheck.org and the Washington Post Fact-Checker in the United States, Full Fact in Britain and Chequeado in Argentina. The digital revolution made it all possible. I remember those early years as an exciting time filled with promise. It was the honeymoon for journalism on the internet, as reporters and editors around the world discovered we could use the web to do powerful, important things. News stories became interactive, enabling readers to engage with content. Data could be presented as vivid graphics that made numbers come alive. And design was transformed: I remember when we first saw Snowfall, the New York Times story about an avalanche, and we saw how the web could be used for powerful storytelling. Then came smartphones, which enabled our readers and viewers to get the news all the time, wherever they were, and use thousands of apps to read articles and watch videos. It seemed like the future was infinitely bright and there were lots more great things ahead. The internet got loud and crowded. Partisan voices began to dominate the discussions and people began shouting at each other in ALL CAPITAL LETTERS. Twitter became a thing, but we realized that some of the “people” on Twitter weren’t really human — they were bots. And they were programmed to pump up the partisan propaganda to drive apart the real people. Partisans took advantage of the internet to build digital fortresses where they could isolate themselves from opinions they disliked. They hid behind the walls and lobbed attacks against their enemies. These fortresses are home to more propaganda than discourse and they provide refuge for extremists. If you’re inside one, your side is always right. The iPhone had changed the landscape when it was introduced in 2007. It created a whole a new platform for apps, which offered promising new ways that people could connect. I remember when a friend in Chile showed me WhatsApp and how he used it to communicate with his friends and family. But it didn’t take long for people who want to spread misinformation to discover they could use WhatsApp without getting much scrutiny from journalists. I know that here in Colombia, you saw lots of misinformation spread through WhatsApp about the peace deal in the 2016 election. Pablo Medina Uribe, the editor of the fact-checking site Colombia Check, reminded me recently how WhatsApp is a fertile ground for falsehoods. People are more likely to believe WhatsApp messages because they’re sent by people they trust. But the nature of many mobile data plans here give people unlimited data on WhatsApp and Facebook but not for their internet browser or other apps. So, on a broad scale, what can we do? More specifically, what can journalists and the tech community do? We need to find new ways to harness technology to get accurate information to people when they need it. We need to be as aggressive and cunning as the people and groups who are spreading the misinformation. And we need to change our thinking. First, the technology part. At Duke University, we’ve launched a project called the Tech & Check Cooperative that has an ambitious goal: to use automation to monitor politicians’ speeches and debates and provide live fact-checking sourced from existing fact-checks. Five or six years ago, I thought this kind of automated fact-checking was a long time away. But advances in technology and the dividends from a partnership we started with Google have created remarkable momentum. So we have already created the first fact-checking app for the Amazon Echo called Share the Facts. It lets you query Alexa and get an instant fact-check. It’s impressive: you can ask Alexa a question and, if the fact-checkers have published something on it, she will reply telling you that the Washington Post or FactCheck.org or PolitiFact checked it and what they concluded. We are now building a similar product for TV and the web. It’s a much harder product to develop than the Amazon Echo, but the idea is that when our app hears someone say a statement that fact-checkers have examined, the app will pop up a related fact-check right on the screen of your smartphone or TV. We’ve made significant progress in the last six months. Over the summer, our students created a rough framework for our app that converts a live speech to text, then filters out sentences that aren’t checkable using our ClaimBuster tool, and then uses an algorithm to look for matches from our database of previously published articles. We are still some months away from a finished product, but we are getting closer every day. We also just completed the first user testing of instant fact-checking on TV. We had people watch specially modified videos of State of the Union speeches that had pop-up fact-checks. The viewers had helpful feedback for us about what they wanted on the screen, and they were unanimous about the concept: They all want real-time fact-checking on their TV. And you don’t need an army of computer science students to create something valuable. We need more projects like the “lie detector” developed by La Silla Vacia here in Colombia, which pioneered fact-checking on WhatsApp. People send a screenshot of a message they would like checked and then the journalists check it and encourage people to share it back through WhatsApp. But regardless of whether we’re building big projects for a television screen, or smaller ones for WhatsApp, it requires that we think differently about the role of a journalist. Most political reporters – and nearly all fact-checkers – have traditionally thought of themselves as neutral players in the political discourse. We published the information in the daily paper and left it on your doorstep. Or we just put it on our website or on the nightly news. That strategy worked fine 10 years ago. But now, politicians and propagandists have learned how to spread misinformation at light speed. We can no longer sit back and wait for readers to come to us. We must become more aggressive and take the facts to the people. We need to disrupt the lies. We can no longer be passive when our readers and viewers are being swamped with misinformation. We need to be more energetic and inventive in getting the information to people at the moment they first hear the claim. Some of these solutions will be high-tech, like the automated fact-checking apps we’re building at Duke. Others can take more of a grass-roots approach, like the WhatsApp “lie detector” developed by La Silla Vacia. But we need all kinds of these efforts, big and small, simple and complex, to adapt how we provide information in these fast-changing times. We need to build new apps for your phone and create new ways to provide the facts while you’re watching a speech on TV. And while print is still around, we should put the truth in ink and paper. Yes, the honeymoon for the internet is over and sometimes it seems like we’re in a dark time. But I’m encouraged by the progress we’re making. I see promising efforts all around the world. And through it all I see great spirit and creativity. The mission of the journalist remains the same: to give people the vital information they need to make sense of their world and hold their government accountable. We’ll continue to do that. We’ll just do it in new and creative ways.